Deicide by Guy Zins is an absolutely stunning piece of visual Christian art that would make a powerful conversation piece in any home décor setting. This beautiful piece of Christian sculpture will be treasured for years to come. Deicide means the act of killing God. Jesus' death was necessary to take away the collective sin of the human race. The crucifixion is seen as an example of Christ's eternal love for mankind. The front of the sculpture depicts Jesus pouring out His love for humanity. The back of the sculpture depicts the first act of disobedience, Adam and Eve being deceived by the serpent. 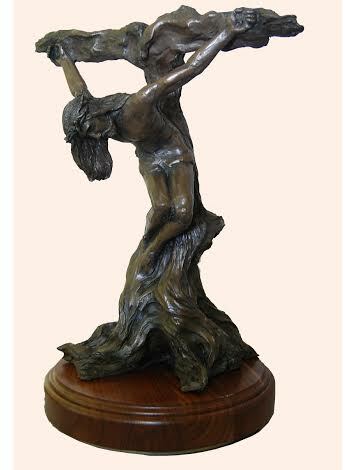 It is crafted using a cold cast bronze technique, which is a modern method of casting sculptures. This casting material consists of a resin mixed with bronze powder. The sculpture is polished and finished in a variety of clear and colored waxes. It is then mounted on a walnut turntable base so it can be viewed from all sides. It stands 17”Hx12”Wx14L and weighs 8 lbs.